Tendeka’s Code of Conduct applies to all our employees, directors or officers, as well as contract staff. Contractors or consultants who are our agents or working on our behalf or in our name, through outsourcing of services, processes or any business activity, will be required to act consistently with the Code when acting on our behalf. Independent contractors or consultants will be made aware of the Code as it applies to our staff in their dealings with them. We want to provide greater clarity about the standards we expect our employees to follow and the behaviours we expect them to adopt. We comply with all relevant legislation and regulations, while also making sure that our individual behaviour is in line with the Company core values – People, Innovation, Performance, Safety and Integrity. 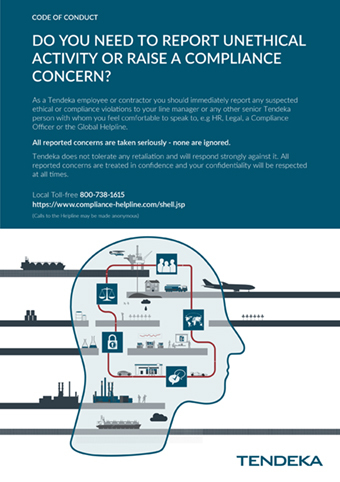 All Tendeka employees undergo mandatory ethics and compliance training, and we will not compromise our ethical standards and reputation.